Georg Friederich Händel was born in 1685, a vintage year indeed for baroque composers, in Halle on the Saale river in Thuringia, Germany on February 23rd. From Germany to England – via Italy. Though his father had intended him for the law, Handel's own musical inclinations seem always to have been clear to him. At the age of 18, in 1703, he traveled to Hamburg, where he took a job as a violinist at the Hamburg Opera and gave private lessons to support himself. He became acquainted with Johann Mattheson (who later chronicled the known events of Handel's life during his stay there) and together they visited Buxtehude in Lübeck in that first year. In the new year Handel's first two operas were produced, Almira and Nero. Whilst in Hamburg, Handel made the acquaintance of Prince Ferdinando de' Medici, son and heir of the Grand Duke of Tuscany, who invited Handel to visit Italy where he spent more than three years, in Florence, Rome, Naples and Venice. By 1706 he had reached Rome, where Marquis (later Prince) Francesco Ruspoli employed him as a household musician and where most of Handel's major Italian works were composed. This visit was significant; baroque music, like that of any period, has its musical clichés, and much that is typical of baroque music can be traced back to Italy and particularly to Corelli, with whom Handel had studied. The influence of Italy was to show itself in Handel's lifetime preoccupation with opera – as well as Italian operatic "stars". His Concerti Grossi too, bear witness to the influence of Italy and Corelli. Italy was a great center of musical activity particularly during the first 20 years of the 1700s, and Handel was to meet and exchange ideas with many of the leading composers, musicians and nobility of the time - and not only Italians, for it was obligatory for every cultural and music-loving person of any rank or nobility to do the Grand European Tour which naturally included the main Italian cultural centers. Thus on his travels around Italy Handel also made a number of useful contacts including the Duke of Manchester, the English Ambassador, and most significantly Prince Ernst August of Hanover, brother of the Elector (later King George I of England) who pressed him to visit Hanover. The Prince may also have intimated the possibility of a post at the Hanoverian court, for when Handel left Italy early in 1710 it was for Hanover, where he was in fact appointed Capellmeister to the Elector, George Louis, who immediately packed him off on a twelve months' leave of absence to visit England. The Royal Houses of Britain and Germany had always been closely inter-related, and the Act of Settlement of 1701 which secured the Protestant succession to the Crown of England, had made Handel's Hanoverian employer George Louis' mother heiress-presumptive to the throne of Great Britain. Thus the Elector George Louis would have been anxious to have Handel spy out the land and report back to him on the London musical, social and political scene. During this first London visit, lasting eight months, Handel was favorably received at Queen Anne's court, though his eyes were largely set on Vanburgh's new opera house, the Queen's Theatre in the Haymarket. Rinaldo, the first Italian opera specially composed for London, was performed there in 1711 and was a sensational success. Returning only briefly to Hanover in 1711, Handel was back in London by 1712 when he was invited to produce an English Court Ode for Queen Anne's birthday. The Queen normally took little interest in her composers, being (according to the Duke of Manchester) ''too busy or too careless to listen to her own band, and had no thought of hearing and paying new players however great their genius or vast their skill''. It is surprising, therefore, that she granted Handel a pension of £200 a year for life. But the Queen's health deteriorated, and by September 1714 Britain had a new monarch. Thus it was that George Louis, Elector of Hanover and already naturalized by Act of Parliament in 1705, became King George I of England, initiating the Royal House of Hanover. One of the first engagements for the new George I was to attend morning service at the Chapel Royal where ''a Te Deum was sung, composed by Mr Handel" - and Handel's position with the new ruler appears to have been secured. In addition to his royal duties for King and Court – his 'Caroline' Te Deum was performed by the Chapel Royal musicians at the king's first royal engagement – Handel became music master to the princesses, for whom he may well have composed the keyboard suites subsequently published in 1720. In the summer of 1717 the king requested a concert on the River Thames and Handel was commissioned to write 'Water Music', for wind and strings. With members of the court and musicians accommodated in barges, the evening's entertainment went on until the early hours of the morning. Handel's great love of opera, its flamboyant singers and the challenge of inciting and maintaining the interest of a fickle public audience began to draw him away from the fairly constricted circle of the court and its music. Handel took an appointment as resident composer with the Earl of Carnarvon (from 1717 the Duke of Chandos) who maintained a complement of singers and instrumentalists for use in his two houses, one in central London, the other in the (then!) quiet countryside at Cannons, Edgware, north London. Handel would have been pleasantly surprised, as would any composer, at the quality of the Duke's musical establishment. As Paymaster General during the reign of Queen Anne, the Duke appears to have made good use of his position in directing a substantial portion of the nation's finances into his private purse, drawing considerable scandal in the process. His musical establishment was of the highest order; directed by Pepusch, it included such names as Francesco Scarlatti, brother of Alessandro, and Johann Christoph Bach, cousin of J.S. The Duke wrote to his friend and court physician Dr Arbuthnot, that "Mr Handel has made me two new Anthems, very noble ones...". Over the next two years (1717-18) Handel composed eleven anthems, a Te Deum, and two masques - Acis and Galatea and Esther. At the same time, during the winter of 1718-19 members of the nobility created an Italian opera company in London, initially funded by an eight-year subscription, calling it, with the king's permission, 'The Royal Academy of Music' with Handel as its music director. Recognizing the vital importance of employing only the very best singers and instrumentalists, especially in the lead vocal parts dominated by a handful of international "stars", Handel engaged the best English singers and instrumentalists, then went to Dresden in search of Italian stars of whom he always managed to claim a fair share. The Royal Academy's first season opened on 2 April 1720 with Giovanni Porta's Numitore, followed soon after by Handel's Radamisto. During the next eight years, almost half the performances were given over to Handel operas. In 1727, shortly before the death of George I, Handel became a British subject, adopting his "new" names of George Frideric. Retaining his position as composer to the Chapel Royal (a post he had held since 1723), Handel composed four large-scale anthems for the coronation of George II and his consort Queen Caroline at Westminster Abbey on October 11th, 1727 which was, by contemporary reports, an occasion of great magnificence. The music which Handel provided for the occasion (the most famous, Zadok the priest, has been sung at every coronation since) was no less magnificent, and its reputation remained vivid for many years afterwards. Five years later, in 1732 the reputation of the coronation music was such that Handel advertised his first English oratorio performance in a London theatre with the explanation "The Music to be disposed after the Manner of the Coronation Service'. A few months later, in January 1728, Gay's Beggar's Opera opened at the theatre in Lincoln's Inn Fields. It was not a true opera but a play with songs made up from popular tunes (including some by Handel), and treated London's low life in a way that parodied current political and cultural events - not excluding Italian opera. Over 60 performances were given that year, eclipsing the final season of the Royal Academy. This was significant in that it marked the beginning of a change in London musical taste and fashion, away from Italian opera in favor of something less highbrow, more home-grown, and more easily intelligible. Handel refused to forsake Italian operas however, and managed despite several dramatic failures, to continue writing and producing them. Many of Handel's friends and supporters tried their best to convert him to English opera, but to no avail. In 1733 some of his friends, colleagues, and former patrons decided to repay his arrogance by defecting from the Royal Academy to form what has come to be called the 'Opera of the Nobility', with the Prince of Wales at its head. At the end of the 1734 opera season, Handel suffered the indignity of having the King's Theatre let to the momentarily prosperous Opera of the Nobility. The move from Opera to Oratorio was not of course an instantaneous one. Handel's Esther composed around 1720 for the Duke of Chandos was performed not in the Chapel at Cannons but in the "grand saloon" as a costume-stage production, already a "halfway house" between Opera and Oratorio. In 1732 Handel revised this work and re-presented it at the Haymarket Theatre. Though it may reasonably be said that Handel "invented" the Oratorio, it was in fact at the instigation of the Bishop of London, who intervened at that point, banning any form of theatrical action on stage of a biblical subject. Through this puritanical censorship Handel was to discover that there was in fact an audience for unstaged biblical music-dramas. Handel then produced Deborah and Athalia, which Basil Lam has called "the first great English Oratorio". Thus on the one hand, the trend towards the Oratorio in Handel's compositional work was increasing, while his operatic activities were simultaneously diminishing – of necessity since the public was now quite tired of Italian opera. In April 1737 Handel suffered a stroke or an injury which seriously affected his right hand. He was exhausted from the stresses of the last five years and his friends and patrons wondered whether he would ever play or compose again. He retired to Aix-la-Chapelle to take the vapor-baths; six weeks later he returned to London, miraculously restored. He was able to play the organ, and began planning his next works. Handel was still determined to write for the stage, but recognizing at last the realities of changing public tastes - and the economics of ignoring them - Handel turned to a form which he had gradually been developing over ten years: English oratorios, in many ways musically operatic, though far more reliant upon the chorus. Alexander's Feast was followed by Il trionfo del Tempo e della Verita, then Saul, and the biblical epic Israel in Egypt (1739). Handel's printer-publisher John Walsh took the unprecedented step of bringing out a full score of Alexander's Feast, thus confirming the popularity not only of the work but of the genre. At last Handel had recognized the public's preference for and taste in English choral works, thus giving himself a new creative lease of life. During the late 1730s Handel also produced more orchestral music. Written primarily as interludes in his Oratorios, Handel's Organ Concertos became increasingly popular in their own right. Socialite Mrs. Pendarves wrote to her mother describing them as 'the finest things I ever heard in my life'. Sir John Hawkins wrote of Handel: "When he gave a concerto, his method in general was to introduce it with a voluntary movement on the diapasons, which stole on the ear in a slow and solemn progression; the harmony close wrought, and as full as could possibly be expressed; the passages concatenated with stupendous art, the whole at the same time being perfectly intelligible, and carrying the appearance of great simplicity. This kind of prelude was succeeded by the concerto itself which he executed with a degree of spirit and firmness that no one has ever pretended to equal." Almost without exception every one of Handel's sacred and secular oratorios was to include at least one organ concerto – Messiah had them for performances in Dublin and London. The Concerti Grossi Op 6 were composed during the autumn of 1739, and published in April 1740, by which time Handel's music was finding increasing favor at the Vauxhall Gardens, where patrons would stroll along the pathways, saunter among ornamental shrubs and flowers, and partake of refreshments, whilst enjoying extensive performances of instrumental and vocal music by leading composers and musicians. Handel's popularity at this popular social venue was attested by the installation of a marble bust of Handel by the sculptor Louis-Francois Roubiliac, commissioned by Jonathan Tyers, owner of the pleasure gardens. During the summer of 1741 Handel received an invitation from the Lord Lieutenant in Dublin to compose a new sacred oratorio which would crown a series of performances of Alexanders Feast, Acis and Galatea, the Ode for St Cecilia's Day and L'Allegro, to be given at the New Music Hall, Fishamble Street, Dublin, in 1742. The commissioned work, on a biblical libretto devised by Jennens, was Messiah. From its first performances in April 1742 (which included a charity preview) Messiah was an unqualified success, taking its place among the finest and best-loved works ever composed. Upon returning to London, Handel made arrangements for an oratorio subscription season beginning early in 1743. He hired Covent Garden, and in February inaugurated the series with Samson, which was warmly received, followed a month later by a performance of the Messiah. 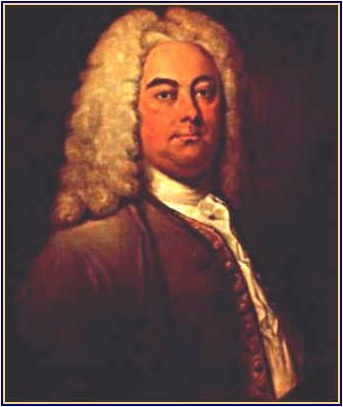 Handel suffered another stroke in April. However he was only temporarily indisposed and soon amazed everyone by the steady stream of large-scale works, mainly oratorios, which he continued to produce. In 1749 he prepared the highly acclaimed Music for the Royal Fireworks to accompany the festivities at Green Park in celebration of the Treaty of Aix-la-Chapelle (a preview at Vauxhall Gardens was heavily attended). The first performance of Messiah at the Foundling Hospital (a London charitable institution of which he had been a Director since 1740) took place in April 1750, thereafter becoming an annual event. He then set about composing Jephtha, but in the course of working on the final Act II chorus, 'How dark, 0 Lord, are thy decrees. All hid from mortal sight', the sight in his left eye failed him, followed not long after by the failure of his right eye. Even when total blindness came in 1752 he continued to perform organ concertos and voluntaries between the parts of his oratorios, so great were his memory and powers of improvisation. He remained involved in the arrangements for performances of his works up to his death on April 14th, 1759. Almost immediately Handel became a legend. He was buried in Westminster Abbey, his burial site marked by a monument, again by Roubiliac. Documents on his life began to flow, and on the 25th anniversary of his death in 1784 an unprecedented series of three commemoration concerts was organized at Westminster Abbey and the Pantheon, culminating on May 29th in a massed performance at the Abbey of the Messiah. Indeed it is perhaps most of all through this great and enduring work that Handel is best known today. first duke of Chandos, provides as worthy a subject as any for a film or television drama. Within the space of ten years, from say 1710 to 1720, he rose to fame and riches, only to descend into relative obscurity following the loss of his wealth which was equally as dramatic as the gaining of it. Along the way he created one of baroque London's most palatial mansions, and was responsible for bequeathing to posterity the inestimable gift of Handel's Chandos Anthems.